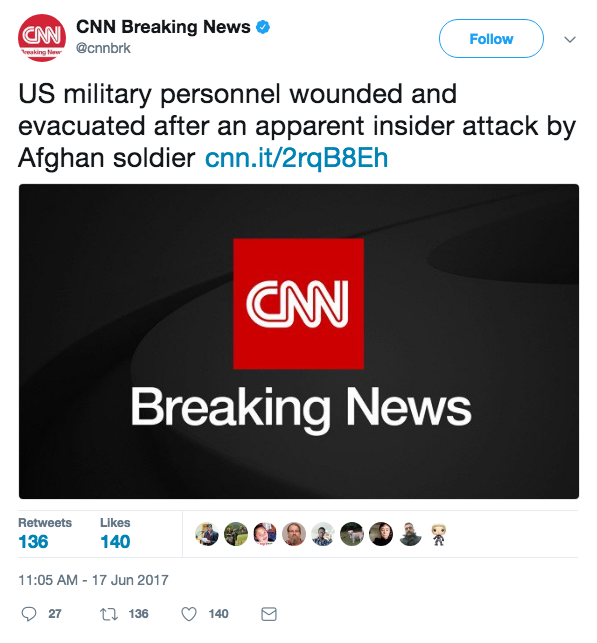 In the second insider attack, or “green on blue” attack in June by an Afghan soldier against coalition forces, seven U.S. Army soldiers were injured and the shooter, an Afghan soldier, was killed. 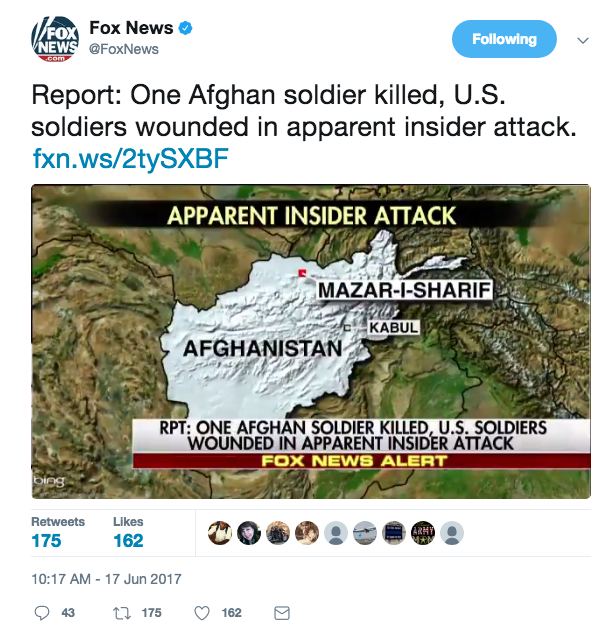 This insider attack comes exactly one week after three U.S. Army soldiers were killed by the same type of attack. “Seven U.S. service members were wounded in an insider attack today at Camp Shaheen, Mazar-e Sharif. The wounded service members have been evacuated and are currently receiving treatment. We are aware of an incident that occurred at Camp Shaheen in Mazar-e Sharif at approximately 2 p.m local time. At this time we can confirm there are no U.S. or NATO Resolute Support fatalities. U.S soldiers have been wounded. One Afghan soldier was killed and one was wounded in the incident. Initial reports of four U.S. soldiers being killed were incorrect. Taliban spokesman Zabihullah Mujahid praised the attack but did not directly take responsibility. Some say the spokesperson said the Afghan soldier was “loyal” to the Taliban. This comes just a week after four U.S. Army soldiers were killed in an insider attack in Achin, Afghanistan. Earlier this June, three U.S. Army soldiers were killed by an insider attack in Achin, Afghanistan. The U.S. currently has roughly 8,400 troops in Afghanistan and recently President Donald Trump said troop levels in Afghanistan will be decided by Secretary of Defense Jim Mattis. A White House aide recently said that the U.S. will be sending 4,000 more troops to Afghanistan.